Believe nothing in politics until it has been officially denied. Otto von Bismarck, the author of this maxim, knew something about politics — a good deal more than something, in fact. For reasons about to be made abundantly clear… you may wish to keep his cynical counsel close at hand. Monday, reporters asked a Chinese government spokesman about the possibility of the United States labeling China a currency manipulator. China has no intention to use means like the competitive devaluation of its currency to stimulate exports. “Trade war is evolving into currency war,” declares Goldman Sachs in affirmation. What prompted the reporter’s question in the first place? The president’s verbiage represents a concrete policy shift, says Credit Suisse Group AG’s global head of FX trading strategy, Shahab Jalinoos. It has now been virtually defined as a currency war by the U.S. president, given that he explicitly suggested foreign countries are manipulating exchange rates for competitive purposes. It is true… the Chinese yuan has lost over 7% against the dollar since the end of March. Of course China is not entirely responsible for the swoon. Nowadays the dollar is a strong dollar — or at least it has attained the status of tallest midget in the circus. And the Federal Reserve is raising interest rates, placing upward pressure on America’s unit of account. “At the moment” — did you catch that? Since the United States imports far more from China than vice versa… U.S. tariffs on Chinese goods bite much harder than Chinese tariffs on American goods. Tariffs cannot therefore be China’s principal trade war weapon. It would decimate the value of its remaining Treasury holdings… and throw the nation’s finances into arrears. The nuclear option is therefore no option. Devaluation is the most lethal weapon in China’s trade war arsenal. 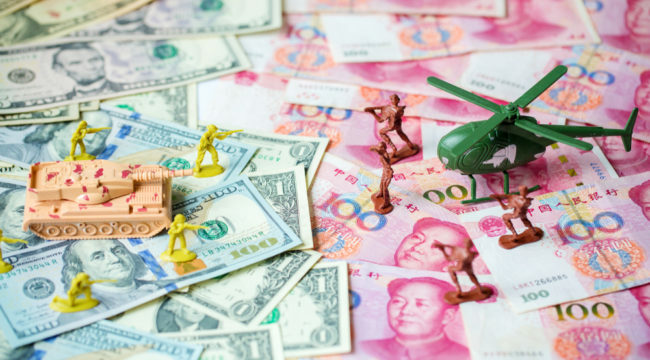 If you can’t win a trade war, you can try winning a currency war instead… China could use a real nuclear option to counteract the trade war by fighting a currency war. But Jim occupies a channel outside the mainstream. He may have predicted Brexit and Trump’s victorious election, yes. But his is not the aroma of respectable opinion; he doesn’t give off the odor of cardboard. Well then, how about a totem of the establishment, a card-carrying Keynesian — and a Nobel Prize winner, no less? We have just described economist Joseph Stiglitz precisely. The excha24nge rate is one of many instruments China could use… They would make a big effort to say what they are doing is not motivated by that. Perhaps a Chinese devaluation is not such a fringe idea after all. China last devalued its currency in August and December 2015. On each occasion — each occasion — the American stock market subsequently plunged over 11%. Jim Rickards says each instance occasioned a real threat of global financial contagion and a full-blown liquidity crisis. Crisis was only averted when the Fed postponed its planned interest rate hikes until December 2016. A third time would be no charm, according to Jim. Can the Fed dodge that shot?